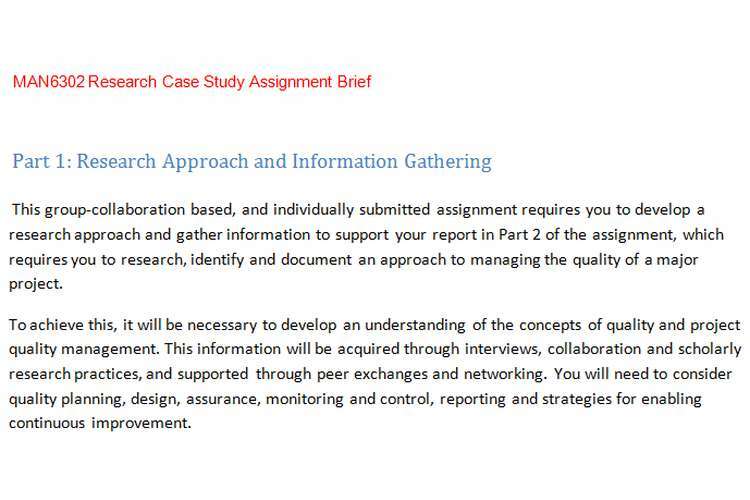 This group-collaboration based, and individually submitted assignment requires you to develop a research approach and gather information to support your report in Part 2 of the assignment, which requires you to research, identify and document an approach to managing the quality of a major project. To achieve this, it will be necessary to develop an understanding of the concepts of quality and project quality management. This information will be acquired through interviews, collaboration and scholarly research practices, and supported through peer exchanges and networking. You will need to consider quality planning, design, assurance, monitoring and control, reporting and strategies for enabling continuous improvement. You are encouraged to consult at least one project practitioner (this can be done via email, telephone or in person), to get a practical understanding of project quality in the workplace and to supplement the theoretical knowledge acquired. A sample question sheet will be provided to guide the consultation process and to gather targeted information aligned to your research. The findings will be used in the report developed in Part 2. The format is a structured interview which must allow for the collection of qualitative (descriptive/explanatory) data as well as quantitative (numeric) data. Information gleaned from the project practitioner should be shared with other members of your group. Please note that you will be required to have the practitioner sign a release form to enable you to use the material as part of your research. This document will be supplied to you. You will submit a brief of no more than 1000 words on the approach you developed and implemented (through collaboration and your own research) to understand project quality. The brief will also include at least: an introduction, the information gathering activities and techniques (e.g. interviewing), that you used to obtain the data for your report in Part 2 of the assignment, a summary and any appendices to demonstrate your activities. The brief should be in a scholarly writing style, including APA referencing. Your report should describe both the research methodology and the information gathered from all the relevant sources. This should allow you to make some general comments and observations. Discussion/synthesis – describe what you found and what you think it means. What is the gap between actual and desired processes and outcomes and what appears to cause it? What are they doing well? What are they doing badly (refer to the theory). Recommendations. How can they close the gap – references to theory are expected. These must be correctly cited in-text and as end references. You will submit a report of no more than 2500 words covering, at least, all the elements listed above which will be in a scholarly style adhering to the APA referencing. Both submissions are via the links in the Assessment/Assignment section in Blackboard. Please indicate the word count on the title page (if applicable). I randomly check so please make sure that it’s accurate! Word counts do not include references. You will lose marks if you exceed the word limit. This will be pro-rata e.g. if you exceed the word count by 10%, you will lose 10% of the mark. 2. An electronic copy submitted via the Turnitin link on the Blackboard site. No cover sheet.